How to Grow a Landscape and Who should Initiate such a Venture? It was a pleasant and insightful meeting in München and our hosts did everything to make it comfortable and intellectually stimulating. The attention for each presentation was substantial and the discussions were sincere and helpful. We all enjoined this pioneering venture into the design research on ‘nature as infrastructure’. Here are some of the main conclusions that were exposed during the debates at the end of each session. There was a general agreement among the 17 (teams of) participants that the design for living systems is in demand of a monitoring procedure. Such a procedure is currently absent, both as a concept and in practice. 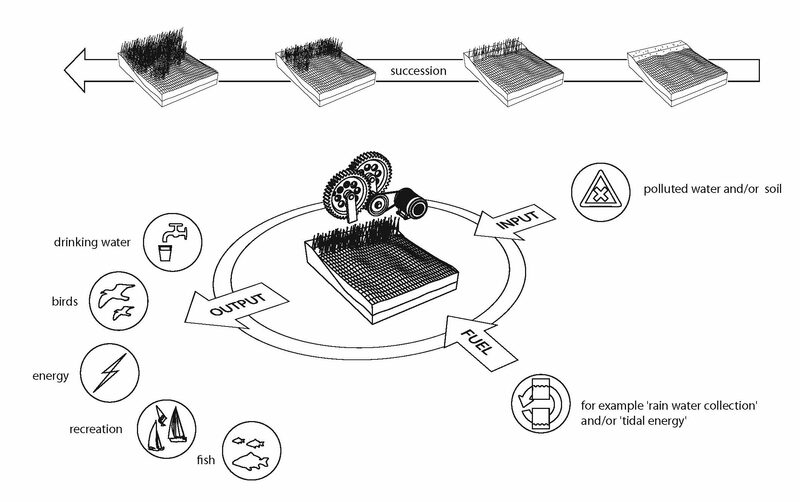 (1) The concept of a monitoring procedure should contain qualitative aspects while assessing for example water and soil quality, energy efficiency, waste cycles and characteristics of biotope development. (2) The practice of a monitoring procedure serves to inform about the performance of the project and the deviations and unexpected development. There is currently hardly any client or governmental position to initiate a monitoring procedure and it was therefore discussed if designers should prepare for initiating steps to enable future development of such a crucial aspect in living system design. Besides monitoring of performance there seemed agreement on a collective motive to position design as a risk undertaking field that is in demand of low-risk experiments on a 1:1 scale because living system design necessarily includes an amount of unpredictability. This is both the charm and the essence of living system design and relates to an equally important development of theory to specify the aspects of such a ‘charming essence’ since this is related to the field of ‘environmental aesthetics’ (not specifically addressed during this symposium, but implicitly mentioned every now and then), including both negative and positive sensations because living systems are not bound to human preference alone, they are bound to biotic and abiotic relationships that rather may be a ‘counterpoint’ (e.g. Matthew Skjonsberg) to human interaction. The presence of ecological theory by referring to authors such as Odum and the concept of entropy and exergy is generally accepted as insightful manners to quantify the many holistic (and therefore also negative) relationships within a living system. It is however necessary not to be blinded by the seemingly objective presentation of such (thermodynamical) models. Even these models contain moral and ideological paradigms that should be made explicit and transparent before using the models as foundations of living system design. If designers hardly attempt to enquire about the fundamental discussions that have led to such ecological models and do not engage with recent journal articles on the topic of ecological modeling; designers could be subjected to unknown flaws and empirically unfounded reasoning. It is the responsibility of design researchers to adapt such models to serve a clear motive instead of simply ‘parasitizing’ on the surface appearance of models for the purpose of scientific validation alone – risking the development of quasi-design-science (e.g. Georg Hausladen). The attention to the multidisciplinary character of living system design and monitoring underlines the extremely broad interests clinging to landscape design. Yet this broadening obviously also can delude the specialized competence of designers as imaginative seducers. In other words, the seriousness and comprehensiveness of the now well accepted responsibility for living systems in general may be an ambition for landscape designers, planners, urbanist, architects and artists, yet somehow they cannot or will not – by their own tradition and professional culture – guide and implement all the necessary strategies to create actual living systems. Designers see what is needed, but they cannot deliver the whole product. This situation is already felt and discussed within academia and so far it has resulted in a number of new names for – maybe – old concepts, such as ‘green infrastructure’, ‘landscape machines’, ‘ecosystem services’ and ‘network design’. It is still questionable whether these ‘names’ benefit the maturation of the profession as a whole. New names might instigate new collaborations (which would be beneficial to the complex knowledge needed) yet they might also instigate a fashionable type of ‘branding’ that leads to unnecessary competition and self-protection amongst colleagues. The articulation of design motives may to designers themselves be vague and intuitive – perhaps more opportunistic? – and would need the aid of social sciences to help clarify and question. A specific performance of a project would need a specific target group to communicate to, how well are we able to adapt our project results to diverse target groups – or: how blind have we become due to academic language? New alliances are needed to ‘grow a landscape’. Alliances within urbanized regions are different to those in un-urbanized regions. Let us not forget that urbanization may be a hot topic to politics and design in general, but landscapes (forests, watersurface, mountains, agriculture and recreational area’s) still make up for more than 75% of the geographical content of countries. During the conference both urbanized and un-urbanized examples have made clear that strategic thinking on project-coalitions demand our attention. In both cases it seemed clear that a local community inclusion would be preferable to top-down implementation. Community inclusion appears to have major advantages regarding long-term management, monitoring and adjustment, education as a means to create awareness and economic viability. Again, an important question was brought forward: if the designers see the necessity of community inclusion, what competences and actions do they develop and undertake themselves to make it happen – besides making it appear obvious by articles and paper plans. Social sciences need to be included more intensely into design-research alliances to avoid the risk of uninformed presumptions regarding public involvement and the manyfold motives varying according to different cultures. Growing a landscapes does not automatically relates to ‘greening a place’. Since landscape design is increasingly intertwined with urban and architectural design and because ecological reasoning has been system related since the 1960’s, we need to be smarter than sales representatives, pitching photoshopped images of luxurious greenery (perhaps by including more text based social media). As academics we appear to be in the right position to examine what ‘growing a landscape’ would mean. Smartly designed urbanization is in some cases better equipped to implement ecological cycles. New material experiments containing biochemical components, nano-technology and (small scale) renewable energy plants still need to be included in our design repertoire. The presence of student work in developing examples of living system design is very beneficial to the speed and intensity of experiments. They however also limit intensive cooperation between experienced designers and researchers. It would therefore be a welcome addition to start design research projects including the university staff members themselves and professional talents. Such collaborations could become part of future conferences addressing specific specializations and themes. Such design experiments are however too complex to handle in a workshop style, they are in need of longer term semester periodicity. Maybe an international network of ‘Design Research Academies’ containing a selection of relevant parties could be instigated to structure such an effort. These ‘Academies’ are temporary programs as part of the existing Msc structures (exchange programs, internships) and they could be part of now dormant design research teams within design offices; linking practice and academia into the exploration of Serious Landscaping.